Palouse Colony Farm, owned and operated by Palouse Heritage, is a real place in the Pacific Northwest's Palouse Country, an area fabled for the fertility of its undulating landscapes. 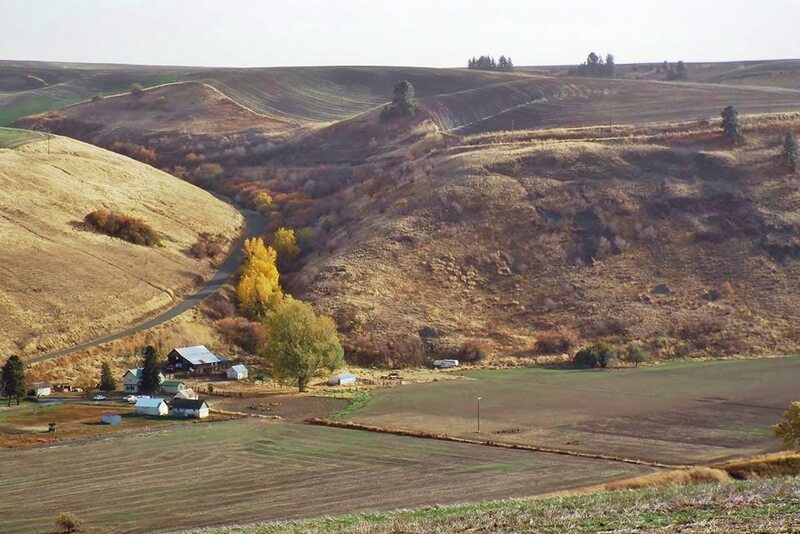 The farm was established along the Palouse River in the 1880s by German immigrant farmers from Russia who applied Old World agrarian methods to the new conditions of life on the Columbia Plateau. These sustainable farming practices included four-field crop rotations to promote fertility, use of natural soil amendments, and restoration of landrace grains and other heirloom produce. The farm was reestablished in 2015 by the Ochs and Scheuerman families, descendants of those who first resided in the historic colony. Today, Palouse Heritage's landrace grains are grown at Palouse Colony Farm using the same Old World organic farming methods used by the farm's original founders. Our landrace wheats and barleys offer a special connection to our past and also provide rare diversity and nutritional benefits absent from today's modern grains. Palouse Heritage grain products are available in our store. The first extensive explorations of the Northwest frontier’s far flung Columbia District took place during the 1850s with the Isaac Stevens-John Mullan surveys from the Rocky Mountains to the Pacific Ocean. Expedition teams sought to promote regional development by locating a thousand-mile route for the Ft. Benton (Montana) - Ft. Walla Walla - Puget Sound “Northern Overland Road”—the first “highway” across the Northern Rockies and subsequent route of railroads and interstate highways. Stevens and Mullan, along with interpreter-artist Gustavus Sohon and guide Donald McKay saw productive Indian and European-American farms throughout the region producing an array of global grains that had come to flourish across the fertile Columbia Plateau. Seed grain for nutritious heritage varieties like White “Hudson’s Bay” Lammas and Sonora wheats and Scotch White oats had been brought west from England and York Factory on Hudson’s Bay via the vast continental “brigade trails” in the 1820s. Hudson’s Bay Company guide and trader Donald McKay led one of the Stevens-Mullan teams in the first recorded exploration of the central Palouse River in July, 1859. One of legendary Chief Kamiakin’s ancestral family camps and farms was located there at “Kamiak’s Crossing.” A colorful figure of British, French, and Cayuse Indian heritage, “Daring Donald” McKay was fluent in Chinook as well as German. His party camped that summer day at an “extremely fertile bottomland with tall pines, luxuriant bunchgrass, and an abundance of serviceberries and wild currants.” Today, Palouse Colony Farm is located at this scenic place between the rural communities of Endicott and St. John, Washington. These 19th century trailblazers’ backgrounds were a kaleidoscope of cultural diversity and many elected to settle in the region. Most “Mullan Road” laborers were army enlistees from Ireland and Germany while civilian packers like Trinidad Castillo and John Sanchez hailed from Mexico. Early settlers and traders here like Preston & Kerlista Matlock and Joseph Delong exchanged fruit and flour for Indian salmon, and patterned fabrics for colorful beadwork—gilded French brass, faceted Russian glass amethysts, and Venetian orange crow beads and ivory “barley-corns” shaped like grain kernels. 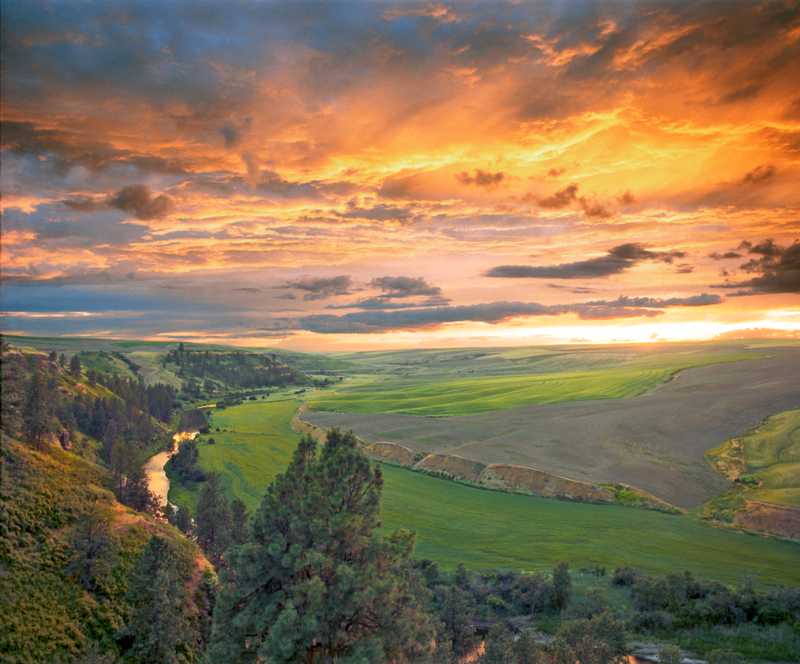 Among other pioneers who followed the explorer-trader wake to this scenic part of the Palouse Hills were Germans from Russia’s Volga and Black Sea regions where they had transformed tsarist domains since the 1700s into Europe’s breadbasket. Traveling in wagons and by railroad to Northwest destinations in the 1880s, members of the Ochs/Oakes, Scheuerman/Schierman, Kleweno/Klaveno, Litzenberger, Pfaffenroth/Poffenroth, Schmick/Smick, Helm, Weitz, and other families adapted traditional four-field crop rotations, furlong strip farming, and other Old World agrarian ways to the new homeland. The Columbia Plateau “Palouse Colony” was founded by a half-dozen of these families who also maintained extensive garden and pasture “commons” areas. These are still evident in colony fence-lines that were brightened by stands of orange-pink sunset roses and flowering vines. The hardy immigrants brought seed of Europe’s prized hard red bread wheats like Russian “Turkey” Red as well as barley, oat, and rye varieties that revolutionized 19th century American agriculture. These and other landrace crops are still raised for specialty flours and other nutritious products at Palouse Colony Farm by descendants of the colony’s founding families.